Triple-jumping over a river of lava as masses of bullets fly past you, dropping towards a robotic turret with both guns blazing – a machine gun/flame thrower/rocket launcher affair in the right hand, blade shooter/shotgun/beam shooter/another machine gun for good luck in the left – which leaves the enemy as exploding pieces in a fraction of a second, all accompanied by a heavy metal soundtrack pounding away as you move onto the next thing to blow up… Mothergunship may be many things. Subtle is not one of them. 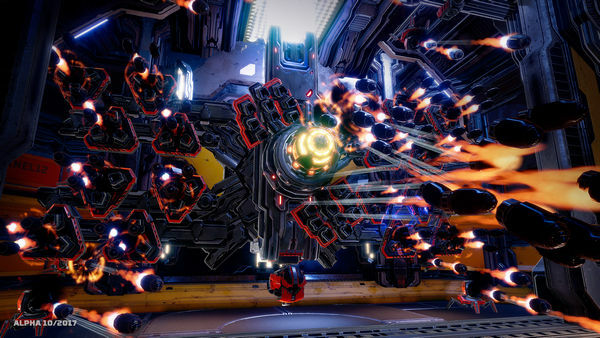 Mothergunship follows in the footsteps of its predecessor Tower of Guns as a randomly generated, bullet hell first-person shooter, with great emphasis placed on the “shooter” part of the description. The scenario has you infiltrating an alien mothership, part of a fleet above Earth, but really all you need to know is that anything shooting at you will explode if you shoot back at it enough, and that no amount of firepower will qualify as “too much”. It’s very fast paced, gameplay encouraging you early on to learn how to triple jump for avoidance and positioning, with enemies shooting at you from pretty much every direction. But those shots are always visible coming from something somewhere, and if you’re paying attention you’ll find yourself moving constantly, blasting back with guns that grow from outlandish to improbable very quickly. Gun crafting is a core element of gameplay, and with the enemies getting stronger as you go it’ll likely be key to progressing smoothly too. 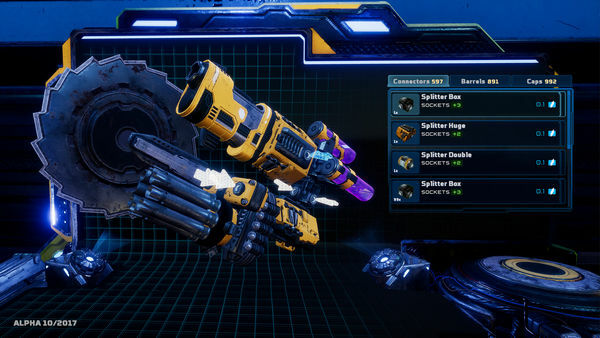 Find a workbench (mercifully in shielded areas so you won’t get shot while working), and you can add and remove barrels, fit damage boosters for perks, and most importantly socket on modular expansions, adding extra hookpoints for even more barrels, boosters, and expansions. It’s like Lego, except with optional flamethrowers. Truth be told, the gun crafting took a couple of goes to get my head around. Adding extra modules for hookpoints is straightforward, but you also need to be sure you’re adding forward-facing ones if you want extra guns blazing; and then start considering if there is too much power getting drawn per shot, or if it’s better to keep fast-firing guns paired with other fast-firing, or long-rang ones with other long-range… or just make guns that do everything, and hope whatever you’re aiming at explodes before your design feels like a bad idea. It’s not entirely an intuitive process, but it’s not overly complicated either – perhaps the biggest concern is of how a game built around such fast action has to be broken up with these moments of stopping to rebuild your equipment. And that is balanced by the anticipation of seeing how much better – and over the top – your firepower will hopefully have become when you move on again. The demo at Rezzed had you pushing through a handful of rooms, mostly without too much of a threat if you keep paying attention to incoming fire, before having you flee – and shoot – a massive tunnelling worm robot through long, lava filled channel… again, not something you could describe as subtle, but as a set piece it felt big and ballsy, which I’m sure was the intention. Mothergunship is a blast, if you’ll pardon the pun. In action, it works hard to keep things coming at you non-stop, and it feels like the kind of game that will progressively push you harder to keep your best twitch-aiming and firing on point all while moving and jumping… though the action does stop from time to time as you rework the hardware you’re carrying, and it can only be hoped this doesn’t break the flow of the game too much playing through the complete title when it is released. Mothergunship is due for release this summer on Steam, PlayStation 4 and Xbox 1.